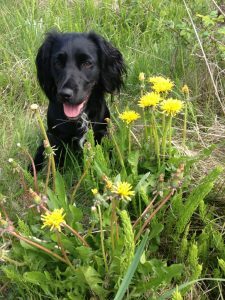 My dog Tassla and I took a little longer break from the gun dog training and now I try to remind her of all the things we did before the break. I always find it very interesting to find out what happens when we take a break in the training. In my experience many exercises that didn’t really work before we took the break suddenly works perfectly well as if the knowledge has had a chance to “ripe by itself” during the break. But there are also exercises that do not “ripe by themselves” – rather the opposite. The main focus for Tassla and me right now is that I want to teach her to sit and stay in that position after flushing. Tassla knows that quite well. I don’t use the whistle very often because she sits when she sees a throw or hears a shot. The only exception is a very low throw that almost looks like a rabbit running in full speed close to the ground. Tassla thinks that these throws are SO very difficult and right now it is hard for her to stay in position. “But a few months ago she knew this and stayed in the right position” – that is one way of thinking. But in Elsa’s and my training philosophy we don’t think that way. Well, yes, Tassla did know this a couple of months ago, but apparently she doesn’t know it now. So what shall I do? As usual, of course! Back to basics! And this is not a failure or a disappointment. It’s only information to me. Now I know that we have to train these situations more. She doesn’t know this well enough. That’s all. 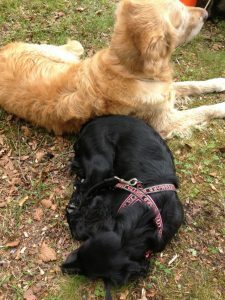 Today Elsa, Åsa, and I trained our dogs together for a couple hours. Elsa and Åsa flanked Tassla and me when we held an area and they threw “birds” and “rabbits” – every time more difficult throws. Tassla recognized the exercise of course and had no problems doing it. It was a little to hard, though, when tennis balls came flying from behind us, along the ground, just a couple of inches from Tassla’s nose. But in the end that worked fine as well. And this very good result simply comes from rewarding all good decisions that Tassla made when she held an area such as stop quickly and sit down or during heelwork when she ignored everything that happened around us and walked at heel with me. We finished off with the difficult “bolting rabbit” that’s released with a bungy rope and thus runs away really fast. I didn’t need to use the whistle here either. “I know this!” said Tassla and stoped right away. After two trainig sessions we were back to the level we had last fall. That’s the great thing when something in the training takes a couple of steps back: Go back to basics for a while (as far back as needed – if the most basic foundation levels is needed – go there!) to remind the dog what she’s supposed to do, and then quite quickly return to a more difficult level. This is really a win – win sitation. 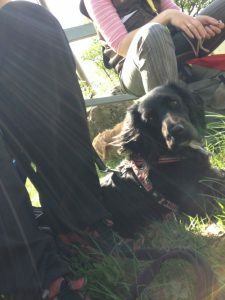 Both me and the dog were happy after a couple of good repetitions where we slowly but steadly increased the difficulty. I think we felt like we’d accomplished something great actually 🙂 That’s always a nice feeling.